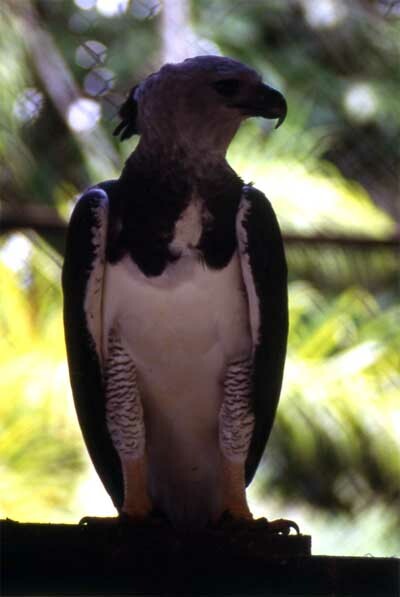 The Harpy Eagle (Harpia harpyja) is one of the world's largest birds of prey, reaching over three feet from head to tail. This awesome predator is a powerful flyer, able to pluck a sloth or monkey off a tree branch. It gets its name from a mythical Greek demon that preyed on peoplealthough this species has more to fear from humans that vice versa. It is increasingly rareespecially near human settlements where there is a lack of suitable prey. It is occasionally hunted for feathers, beak and talons. These may be used for shamanistic ceremonies or sold to tourists.